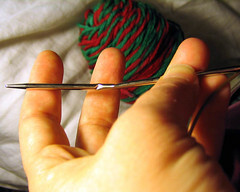 A 24″ circular US3/3.25mm addi turbo knitting needle, sadly bent. I put my knitting down beside my recliner, leapt up, and apparently caught the needle between the footrest and the chair body when it slammed shut. Oops. Another precious addi bites the dust. I’m hell on needles. With a name like that, no wonder. Emily wanted to know what the planetary symbols are, so that she could more easily identify the glow-in-the-dark planets on her ceiling. She decided not to have them orbit the sun anymore, but instead to move across her ceiling in a rough line as if she were looking up at them at night. Since she can’t rely on position to identify them now, she wanted to use the symbols which are painted on their southern poles. I knew some but not all (I always screw up Jupiter and Saturn), and she wanted me to write them all down so we pulled up NASA’s page listing the symbols. She looked at the page for a while and clicked around the “kid stuff” sections. Me: NASA? It’s the National Aeronautics and Space Administration. NASA. It’s where the American astronauts work. Me: Yeah! NASA! There’s a base in Florida, and one in Texas. The astronauts and all the people who help the space shuttle go up work there. Now I’m wondering if she thought astronauts were imaginary, like fairies and mermaids. I mean, she learned about the moon landing in school, and she can reel off the names of the most famous astronauts, and she tells us all the time she wants to be the first person to walk on the sun (ouch!). I even did a Brownie program involving space that used a handout on female astronauts. She should realize that yes, astronauts are out there. But her level of incredulity makes me wonder. Maybe she thought it was a “long time ago” thing, or maybe she didn’t realize there was a whole organization devoted to these things. Or maybe, way in the back of her mind, it really was in the same category as wizards and magic wands. 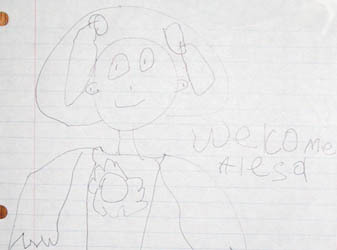 Yes, Virginia, there is an astronaut. Knitting up my handdyed Holly Jolly yarn as thick socks for my daughter. 48 stitches on size 3, gauge is 6.5=1inch. It’s a bit dense on 3’s – if I were someone else, I’d take it to a 4 or 5. Stripes at this gauge are 6 rows long. I’m loving this and want to dye more ASAP. It’s Thanksgiving. You can’t go wrong with the back o’ the can Libby’s recipe. ‘Nuff said! I hope you and yours are having a wonderful Thanksgiving holiday. 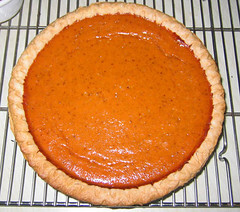 ETA: My mom mentioned that my pie crust looked extraordinarily even. She’s right – I used a frozen crust this year! And let me tell you, that crust added nothing to the pie. I won’t be using storebought again. There’s a balance between timesaving and skimping, and this crust crossed over that line! Em skips into the room. Em skips out of the room. I think I need to pick up a couple of cupcakes for Thanksgiving. 246 yards DK weight superwash wool, crockpot dyed with acid dyes. Base was blue left over from previous dye session. It was more kool-aid blue than I would have liked, so I softened it up. Pink was added to one side after blue had exhausted, then lilac added to other side after pink had exhausted. Knitpicks ties its skeins tighter than I do, which resulted in the white around the ties where the dye didn’t penetrate. 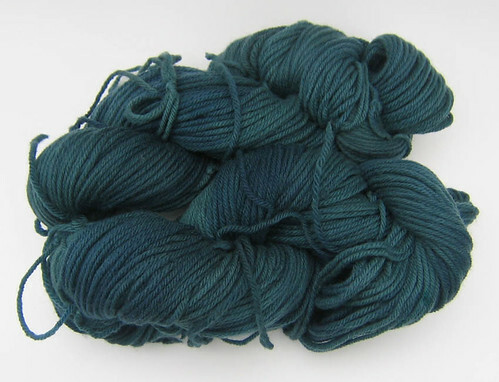 Note to self: retie Knitpicks yarn before dyeing. That’s it for the hand dyes for now. I’ve still got a couple of skeins to do, but the holidays are upon us. As for the Christmas yarn, my father suggested it would make something nice for Emily. So there you have it. I’ll be casting on for Christmas socks for Em either tonight or tomorrow. Lest anybody think that it’ll mean less knitting for me, her feet are 9 inches long and 8.5 inches around. 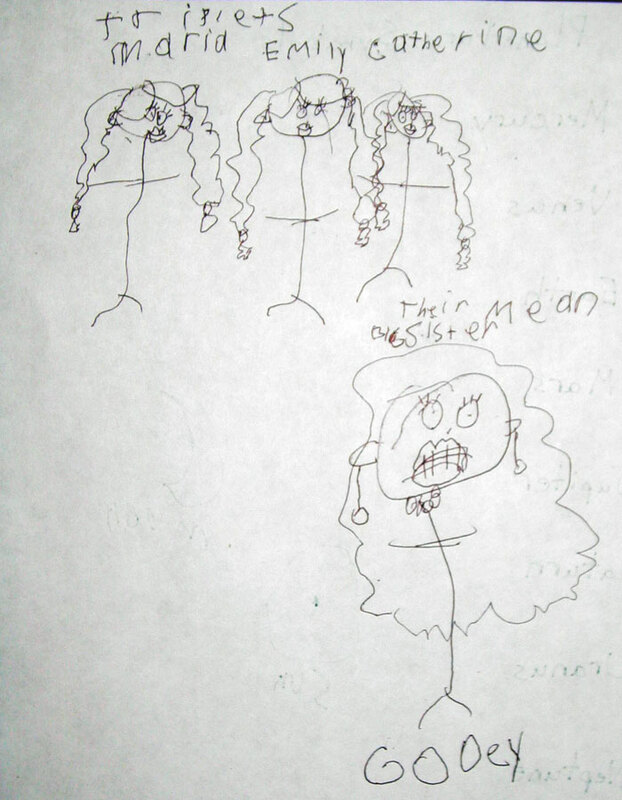 This means that she and her grandmother can share shoes. 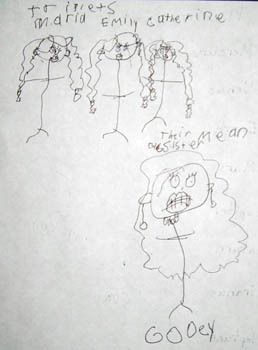 My girl’s a Sasquatch! There’s a session tonight, and I never did blog last week’s! Shame on me! Here it is, if you’re interested. Merry merino! Ho ho ho! When I hold it up to my ear, I swear I can hear sleigh bells. Now come with me back to Sunday, when the most festive yarn in all of Christmastown was born. Dye day at Jetsyknits’! The perfect time to try out my box o’ PVC pipe, which I have dubbed the Yarnomatic. Previous to dye day, I wound a skein of Bare DK weight from Knitpicks into a ball. I had an idea, and I needed a nice little packet of yarn for it. On dye day, I laid the Yarnomatic out in one long line with posts sticking up, then laboriously walked around it, hunched over like Igor from Young Frankentstein, wrapping yarn from my pre-wound ball around it as I went. Turtlegirl76 came to my rescue, taking one half of the Yarnomatic while I took the other. She also offered great suggestions for future configurations, like rotating the joints in the middle and adding shorter lengths of pipe (which I have) to create legs, so I wouldn’t have to kill my back leaning down as I go. I’m also considering making it into a big triangle and standing in the middle to wrap, although that might just make me dizzy. The yarn was loosely tied at regular intervals. It really should have been tied more often, I think, because we got a little tangling on one end. Once dyed and dried it set itself to right pretty quickly, though. Also, I should have used a different colored tie to mark the halfway point on each side. As it was, I had to eyeball it and I was off just a hair. 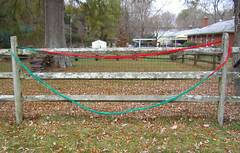 The red side is 3 yards long and the green is 3 yards, 18 inches long. Eh, close enough. Live and learn. One side was handpainted with Jacquard emerald, and one side with fire red. The fire red side got a bit of concentrated suspension in a few spots, so it’s not as even as I might like. It’s my own fault for jamming the yarn into a jar of dye in a moment of gleeful abandon. However, it’s not that noticeable. I’m still happy. I’ve since done some research on how to prevent Dye Goo from suspending out in yellow and red, so it led to some learning, which is always good. Check out the color join! Not a lot of bleeding from one side to the other there! I laid out extra plastic wrap and wrapped the two sides separately, then encased them as one yarn sausage for steaming. It did a good job of preventing contamination from one side to the other. Unwinding the skein was laborious, since you can’t exactly put a skein that large on the swift. My idea was to put it back on the Yarnomatic and ball it, but it was cold outside and I didn’t feel like reassembling all those pipes anyway, so I strung it over a few bits of furniture in the house and balled it into a conventional ball, then used a swift to reskein it to standard dimensions. I’m thrilled with how this turned out, and no amount of groaning from the holiday weary souls around me can change that. 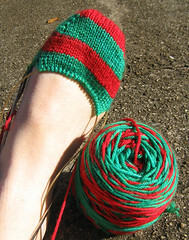 This would make some cute socks, maybe with an afterthought heel to preserve the striping. I’m excited to knit it up and see how it does. I’ve got some extra Bare DK weight – I’m wondering what other stripe combos I should do. 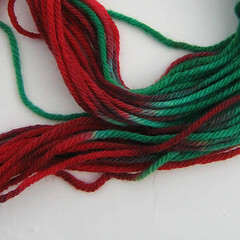 Or heck, maybe someone else needs some Holly Jolly yarn. 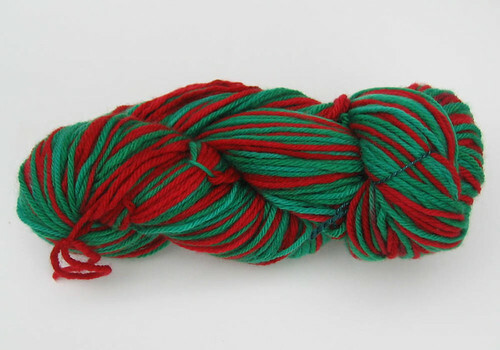 It’s only 246 yards per skein, but 246 yards of holiday cheer goes a long way. Here’s 420 yards of worsted yarn dyed in the crockpot. This is the diluted gunmetal, sky blue, primary blue, and black left over from yesterday – I had dipped a cup out to reserve – mixed with strong emerald. 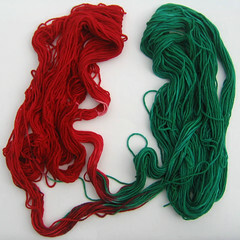 Yarn started as a natural cream, not a true white. I originally purchased this at Dianne’s store in South Carolina. She has since cast off the brick and mortar store to concentrate on her gorgeous hand dyes at http://creativelydyed.com/ . I know she had mixed feelings about letting her store go, so I may write to her so that she can see that some of her yarns from that time are still being put to good use. By the way, I have no idea what I might do with this. 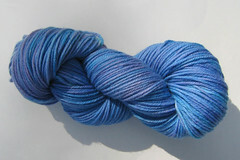 I’m starting to reach a point where I really need to start gifting, trading, or selling some of my handdyed yarn. I’m trying to declutter my house, not add more stuff! Also, everything I said about preferring subtle variations of tone got tossed out the window at Jet’s dyeing party. I’ll be posting that little gem when it’s completely dry. 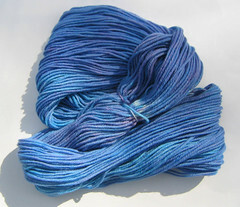 I’m gearing up for a dyeing party today, so I probably won’t have time for a proper post today. Instead I offer up this. It’s an ad for Twinkies from the Nov 1977 Jonah Hex comic. 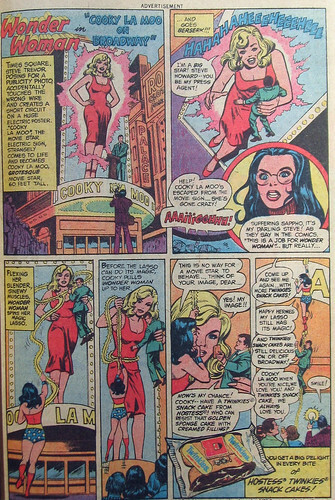 I don’t commonly associate Wonder Woman with junk food, but maybe all the chemicals grant her her superhuman strength. Clicking on the picture and then on the “all sizes” button at the top brings up a larger view.